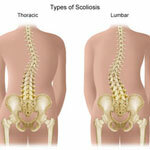 The most commonly found type of scoliosis is called “adolescent idiopathic scoliosis”. Idiopathic means “of unknown origin”. But recent research into the cause of scoliosis seems to suggest that there is often a genetic factor which affects the control of the growth of the spine.Scoliosis can affect both children and adults. In children it can be a more serious condition because it can rapidly progress as the child grows. Osteopathic care for scoliosis can be very effective, especially when the deformity is in the early stages. The treatment program requires a commitment by the patient and their family, but if undertaken enthusiastically it has the potential to prevent the need for much more drastic treatments later on.